In the children’s fairy tale, the Tortoise and the Hare, slow and steady wins the race. But in today’s online world, we are an impatient society. We want immediate response to our requests. We get frustrated when we have to wait for anything, especially for websites to load. If your website speed does not meet the patience criteria of your visitors, they will hit the back button, sending a signal to Google that your website is not a quality user experience. That behavior over time could affect your search engine ranking. There are two major reasons to care about how fast your website loads. There is a valid reason why Google is encouraging everyone to think about how performance affects a user’s experience of their page. In this impatient world, how long do you wait for a page to load? And if it doesn’t load within your patience criteria, do you click the back button? Of course you do. The faster the page load time, the better the user experience. An improved user experience translates into higher conversions and more revenue. And a 1 second delay in page response can result in a 7% reduction in conversions. In other words, a bad user experience negatively affects your sales. Google has been using page speed as a ranking factor for desktop browsers since 2009. And now with page speed being a ranking factor for mobile searches, it is even more important that your website be optimized across all devices. Pages with long load times tend to have higher bounce rates, which can send a signal to Google that the page is not worthy of ranking. A better-optimized and fast-loading page will help deliver better rankings and give your site an advantage over your slower loading competitors. Assessing the page load speed of your website is something that may sound difficult. You may wonder how you can know how fast your site is not only for your visitors but also in the eyes of the search engines. 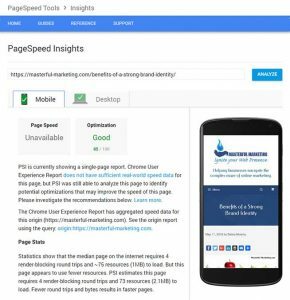 Google provides a tool called PageSpeed Insights that measures website page speed and provides detailed information on how you can improve your load time. You can access the tool either directly through the link above or through Google Analytics in the Behavior section under Site Speed. 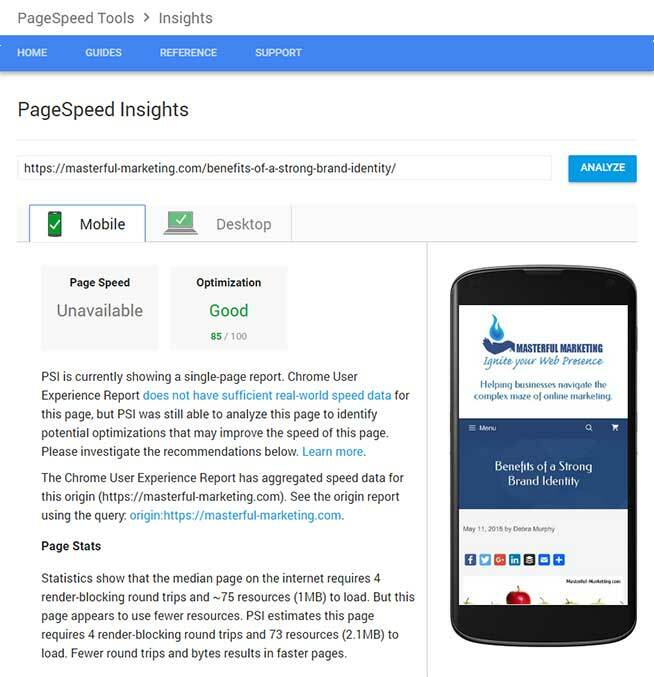 PageSpeed Insights gives you a report on how well your site performs and suggestions for improvement. 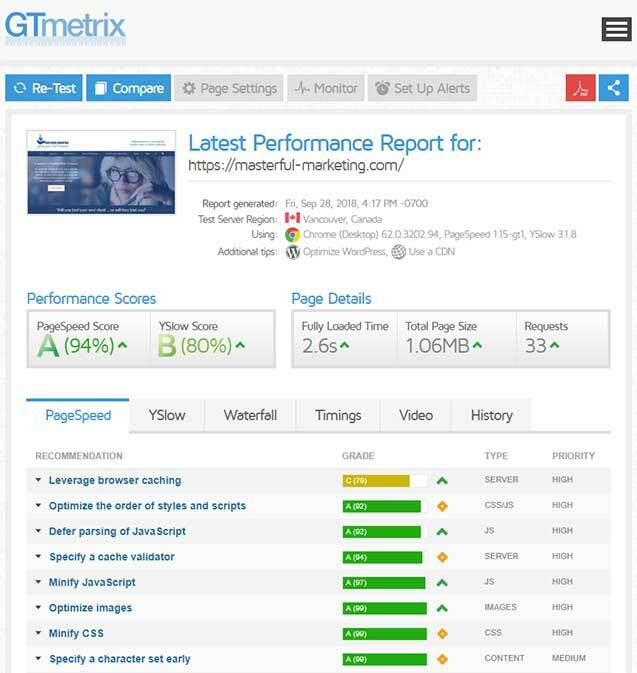 GTmetrix also provides a page speed report. Once you run the report, you can download a PDF file of the details. 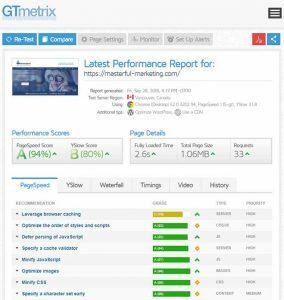 GTmetrix also provides a WordPress optimization guide to help you with your performance optimizations. The goal of both these tools is to evaluate your web page based on a set of rules and provide recommendations that you can use to improve the page load speed of your website. We build our websites in WordPress, a wonderful content management system that gives us many options and puts us in control of our web presence. But all this control and flexibility can affect how well our websites perform for our businesses. You put a lot of work into your inbound marketing efforts by creating quality content that is optimized to attract the right visitor. But if your visitors come and leave frustrated, you’ve lost an opportunity. So what can you do to help improve your website performance. Many useful features can be implemented using a plugin. However, you need to ensure the plugins you use are not only needed but created by reputable developers. As much as I just love plugins, I make sure that those I use are adding value to my website and don’t affect the performance of the site. The more you install and activate, the more likely your website will load slower. There are some that help speed up your site such as Autoptimize which can aggregate, minify and cache scripts and styles, moves and defers scripts to the footer and minifies HTML. Many users don’t realize that the image you took on your smartphone is a high resolution file, maybe 2 megabytes or more. If used in its original format, loading that file or even its thumbnail can slow down your page speed. To create a quality image, size your image at 72 PPI (pixels per inch) and make the image about 9 x 12 inches. Photo editing tools such as Photoshop or Pixlr allow you to save for the web and reduce the size of the image. Even reducing the size of your images manually may still not be enough. The Smush Image Compression and Optimization plugin optimizes images as you upload them by automatically running them through Smush.it. Just install and activate the plugin. Images already on your site can be compressed in bulk or individually. WordPress creates pages dynamically as they are requested by pulling the content from the database and applying the theme template. A cache plugin saves pages when they are retrieved so that future requests for the same page can be delivered faster. There are a few quality caching plugins available but some hosting companies are now installing caching on hosting accounts. Siteground has their own SuperCacher plugin that handles caching individually for each hosting account. The WordPress database can grow very quickly, resulting in your website loading slowly. When you are writing or editing a page or post, WordPress has an auto-save feature that frequently saves revisions. This is a great feature that enables you to recover a previous version. Just remember each revision increases the size of your database which slows down your website. Perfmatters is a plugin that allows you to limit post revisions and increase the auto-save time from 1 minute (the default) up to 5 minutes. It also contains a number of other settings that helps increase performance of your website in general. Spam comments, trashed posts and pages, plugins that didn’t clean up their database tables when deleted or unused images can also increase the size of your database. WP-Optimize is an effective tool for automatically cleaning your WordPress database to reduce its size and ensure your valuable content gets retrieved more quickly. A CDN delivers your site content to different networks so users can download your content from the closest server, which will increase load speed. There are several high performance CDN services and if you are running an eCommerce site, they are worth the fees. In addition, if you have a lot of traffic to your site, you may want to try CloudFlare, a free CDN that speeds up sites and provides protection against many security threats. Your hosting company is a major player when it comes to website performance. Dedicated Server – You have full control of the physical server, and complete access to all its resources. Managed WordPress Hosting – Because of the popularity of WordPress, companies are emerging that specialize in creating an optimized WordPress environment with specialized support for WordPress, themes, and plugins. WordPress puts control into the hands of marketers and small business owners. But with that power smart decisions need to be made when it comes to “feature rich” verses “website speed”. Balance the two for a quality user experience that keeps visitors coming back for more. How have you increased your website page speed? 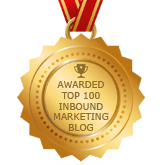 Some months back I was facing so many issues with inbound marketing. I made a lot of efforts by creating quality content and included other quintessential things to entice the right visitor, but I failed. After so many evaluations, I realized there are issues with the website speed, which plays a vital role in inbound marketing. The engagement level of customers affects a lot of the websites do not perform well of businesses. Henceforth make sure that your visitors don’t come and leave, as you can easily convert them into a lead. Thanks, Debra to sharing the most important knowledge about the website, and I have reduces my website speed from 4 seconds to 1,23 seconds Thank you so much. 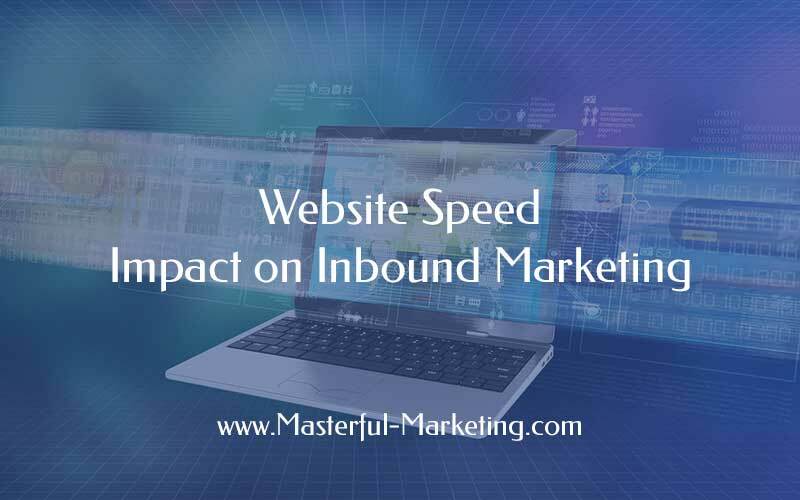 Website speed matters a lot in increasing the inbound marketing activities. We build our websites in WordPress, which must be adequately optimized so that it can help improve your website performance. I follow this firmly as long as I didn’t maximize my website and made it SEO-friendly, I was not able to drive customers. To improve the website speed, I searched many platforms which can help me optimize the website. 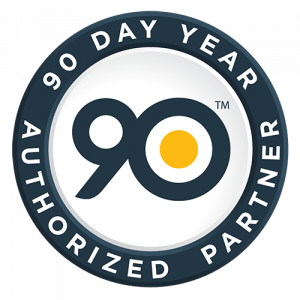 Then I finally switched to a marketing automation platform called Aritic PinPoint which enabled me to implement SEO strategies and finally I was able to improve my website’s speed.